A log truck carrying western red cedar logs out of the home range of the Columbia North Caribou herd, past a sign warning motorists to watch out for wildlife on the road. 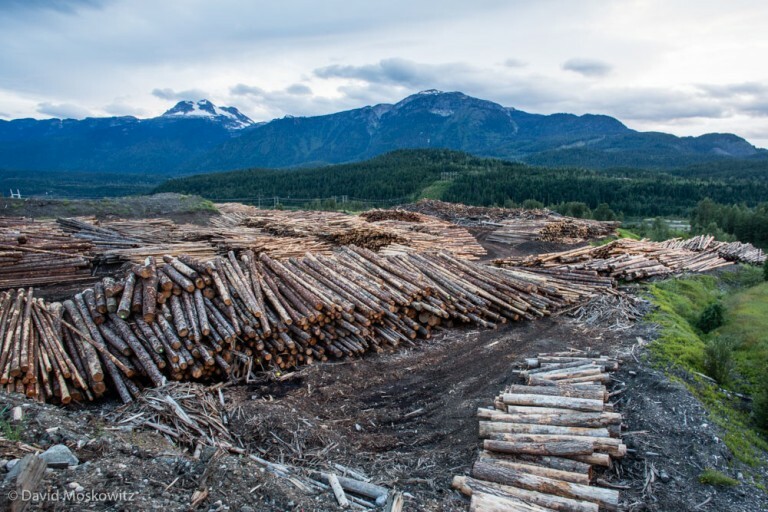 The timber industry has been the backbone of the economy in most of the interior of British Columbia for several generations. Industrial scale logging is also the primary source of the majority of challenges facing Mountain caribou. Because of this, sorting out how to protect caribou habitat while at the same time dealing with the demands of the very powerful timber industry (and modern civilization for that matter) for lumber has been an especially challenging task in attempts to conserve and restore caribou populations. How well this has been done varies in different locations around the province. A few thing are clear. Mountain caribou depend on low and middle elevation old growth forests for early winter habitat, and high elevation old growth for winter habitat. Clearcuts and early stages of forest regeneration are prime habitat for moose and deer which attract attention from wolves and mountain lions who then prey on caribou more often in landscapes with a large logging footprint in them. Logging roads become access routes for humans on snowmobile in the winter to areas that are sensitive for caribou who are easily displaced by human recreation activities in the winter. A large amount of habitat has been set aside for mountain caribou which has curtailed logging in some areas and road use restrictions have been put in place as well. However, logging of both old growth and second growth forests continue in mountain caribou habitat in some places. Lumber yard in Revelstoke, British Columbia. The logging industry is a primary employer in much of the region. Mill worker on his way to work at the lumber mill in Revelstoke, British Columbia, a town where both timber and tourism are major and at times competing components of the economy. Mountain caribou conservation has put stresses on both in terms of restrictions on logging as well as the heliski and snowmobile recreation which are big business in the area. 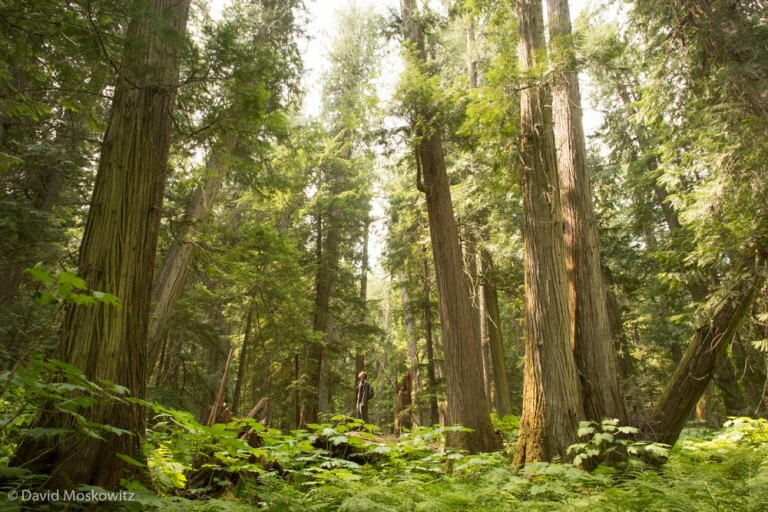 British Columbia is the last place in the Pacific Northwest with significant stands of old growth forest still slatted for logging, both on the coast and in the interior. Conservation groups have used caribou protection as a tool to curtail logging in these ancient forests, much the spotted owl was used in the United States several decades ago—imperfectly in both cases. With caribou populations continueing to decline in much of their range logging interests have started looking at having these restrictions lifted once the caribou disappear from an area while conservation groups are looking at what might be the next lever for protecting whats left of this unique inland temperate rainforest. A recently logged second growth forest in the Seymour River watershed. 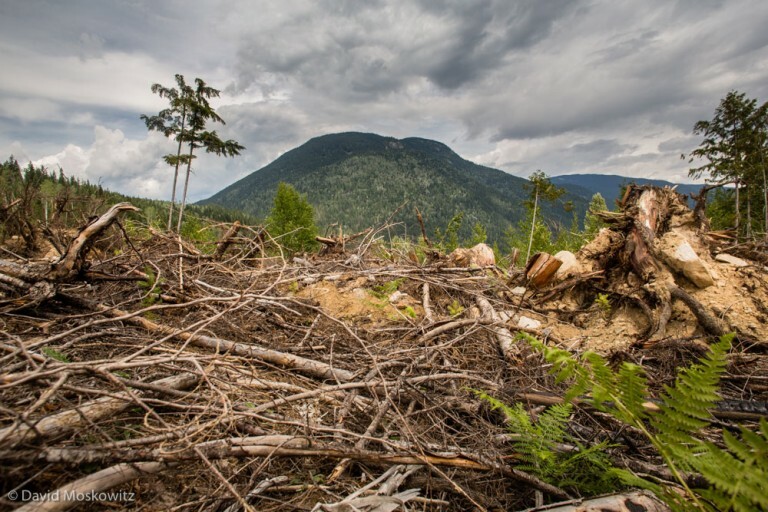 Industrial scale logging which employs large machinery to cut and remove logs often leaves a devastated appearing landscape behind, including lots of wood cut and left on the ground, to expensive to transport out for the value of what can be made from it. Kim Shelton takes in the grandeur of a remnant stand of old growth western red cedar close to Trout Lake British Columbia. How we as a society place value on forests and trees such as these is highly varied. Whether places such as this, and the animals such as mountain caribou whom depend on them, will continue to exist in any significant quantity for future generations to argue about seems tenuous at the moment. MCP Field Notes: North Columbia Herd.